According to Dr. R. K. Bansal (n.d) a structural element which is used to support heavy loads in different structures is called beam. Beam in any structure bears huge load which tries to bend the beam and beam support the structure by resisting the bending produce by the load. Ability of the beam to resist the load depends on the type of beam, material of beam and shape of beam, S Timoshenko (1940). According to there are many different type of beam and each one of these beams can be of any material and can of many different shapes. In this experiment only two types of beam will be discussed one is simple supported beam and other is cantilever beam. Talking about the material of the beam, in this lab experiment three materials brass, aluminum and steel will be discussed. 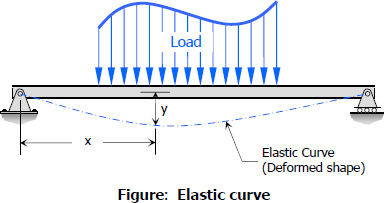 Elastic modulus is the mechanical property of material which is the ratio of tensile stress and strain. Greater the value of the elastic modulus stiffer the material is and lower value of elastic modulus means the material deflect a lot at small stresses, M. F. Ashby (2010). Experiments were performed on simple supported beam and cantilever beam made of three different material brass, aluminum and steel. Data of experiments was written in their respective tables. With the help of the data collected from the experiment graphs were prepared for each and every case and all those graphs are mention below. 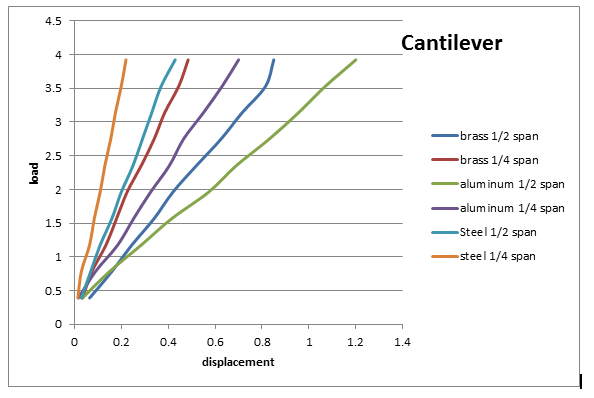 Six different experiments were performed to study and understand the deflection of simple supported beam and cantilever beam and results are been shown in two tables and six graphs in result section. Now each graph will be discussed here. Second graph of aluminum shown the similar trends like the brass graphs. It also has liner response between load and displacement but its value of displacement for the given load is more than that of the brass which shows that aluminum is more ductile than that of brass as explained by B. K. Agrawal (2007). 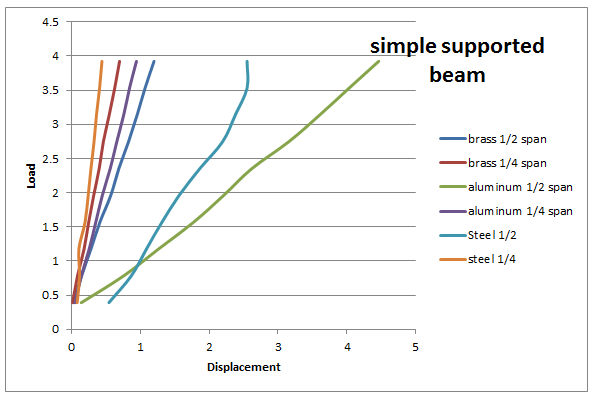 The third graph of steel has very graph of brass and steel and has linear response for both spans but its values of displacement at the given load is smallest from other two which show that steel is less ductile than other two and has highest value of elastic modulus and this property is being proved by George Murray (n.d). According James M. Gere (n.d) to the equation of deflection, second moment of inertia of the beam which is the property of the beam related to its shape and dimension has very important role in deflection of beam. Beam with high value of second moment of inertia or second moment of area will show less deflection and beam with low value of second moment of inertia will show larger deflection. From this it can be concluded that the second moment of inertia is property of beam which resist the bending or deflection of beam. According to the table the value of elastic modulus for brass is about 37.5 GPa whereas the value of elastic modulus in books is 105 GPa which is almost three time the value obtain from the graphs or experiments. Like that for aluminum the value of elastic modulus is almost 26 GPa which is almost 2.5 times less than the book value of 69 GPa. For steel the elastic modulus value is about 29 GPa which more than six time less than the book value of 200 GPa. According to Raymond Aurelius Higgins (1994) there is a great different in values of elastic modulus, which shows that there are some errors in the experiment and those errors needed to discussed in order to get accurate values for elastic modulus. Error in the beam experiments could be form two sources one in apparatus error and second is human error. Instrument error includes inaccurate dial gauge, apparatus not balance on horizontal surface or beam is already deformed. A personal error includes observation and calculation with wrong method or lack of experience in experimentation. Error in apparatus which is also known as instrument error can easily be find out by repeating a certain experiment over and over again if all experiment show inaccurate value means apparatus has some errors. It can be removed by calibrating it with a good standard apparatus. Personal error can find out by repeating the experiment with some experience person and can be removed by practices. Aim of studying and understanding the different types of beams and effect of different factors in deflection of beam has been completed successfully. Six experiments were performed on two different types of beam under tow different conditions and result where plotted on graphs and were discussed in details. From these experiments it can be concluded that the deflection in a beam under a constant force depends on its type, shape, material and point of application of force. It can also be concluded that the experimental elastic modulus of same material is different in every case and really depends on the beam type, shape and loading place. Thanks for this report. I found the sources of error in the experiment discussed very helpful.